People are aware that designers can be very creative. They come up with all kinds of designs for their works of art. They are also very picky when it comes to the material they use. There are those who use silk, cotton, or wool while some use organic fabrics. However, one designer decided to use what could be the most disgusting material ever. Find out what it is below. Can you still remember the designer behind this viral Skittles-inspired dress? Sarah Louise Bryan did it again but this time she used the grossest material ever. She solicited pubic hair from people through her Twitter account. It took this mother of two six months to collect pubic hair as well as hair from people’s head. During this period, she stored the material in her son’s bedroom. When it was time to make the dress, she used a face and eye mask and the thickest gloves she could find. The whole procedure made her gag. After all, who wants to handle pubic hair? 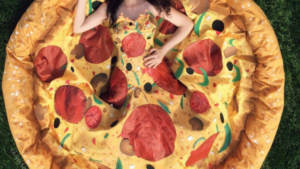 She really nailed making a dress from the most disgusting material imaginable. She doesn’t stop here. She’s actually working on another dress that is, you guess it, made of equally gross material. When it comes to creativity, some say Sarah is a genius, but hopefully she’ll consider returning to materials that will actually make the wearer proud instead of disgusted.